MICHAEL H. HANSON’s fictional SHA’DAA series began as a handful of apocalyptic short stories he wrote that appeared in various no-longer existing e-zines and webzines on the world wide web back in 2004. They were tales of a contemporary earth under siege by all manner of evils and monsters who appeared on our planet through numerous magical portals. Hanson soon came up with the idea of turning his concept into a Shared-World, a group anthology of short stories by many authors, all taking place at the same time, i.e., the 48 hours of the terrifying event known as THE SHA’DAA, where 1,000 mystical portals that separate earth from 1,000 different hell dimensions grow thin and weak for two days, thus allowing endless armies of creatures and monsters access to our world. The conceit of the Sha’Daa series is that this event has actually occurred once every 10,000 years throughout the entire history of earth from its ancient creation all the way to the near future when the current series takes place. In 2005, Hanson struggled to find a way to make his reach exceed his grasp. He wanted to bring talented authors on board his project, but he had no Agent, no publication deal with a Publisher, and had not yet broken into the “paying writers’ market” and so had no Reputation to leverage. And then it hit him. What if he approached, via e-mail, many of his fellow online authors of fantasy, science fiction, and horror who had been publishing work in the rapidly expanding field of webzines and e-zines, but like Hanson had not yet broken into the paying markets? He spent three months reading a few hundred published short stories on the internet, looking for authors who were creating solid work, but like him, were not yet getting paid for their tales. 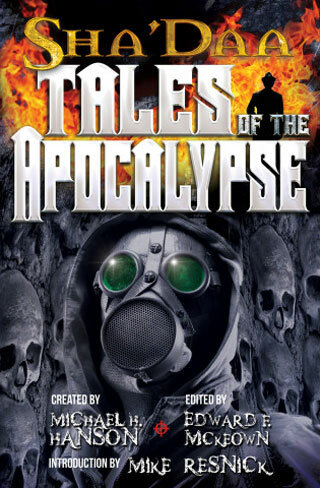 In the end he compiled a list of 33 writers, women and men who seemed to excel in the fields of science fiction, fantasy, and horror, and sent them all a detailed and lengthy e-mail proposal for “Sha’Daa: Tales of The Apocalypse” (the first anthology in the series that now contains five books and growing). 18 authors decided to take a chance on this no-guarantee guerrilla venture into the publishing world, with no upfront money, a tenuous promise of future royalties, and nothing but a hope and prayer that a publisher could be found for this project. And this is where bright-eyed optimism and pure naiveté slammed face first into the real world, for when the first book in the series was finished, proofread, and edited, no publishers were interested in this rag-tag group of newbies and their odd little project. To make a long story short, it took three years to find an Agent, and a full four to find a small Independent Press to take a chance on TALES. It was a long, slow, and frustrating four years that nearly had Hanson shelving the whole thing over several bouts of severe depression, but, with the strong emotional support of family and friends, and Sha’Daa Editor Edward F. McKeown, Hanson and his team of fellow underdogs stuck to their guns to see “Sha’Daa: Tales of The Apocalypse” publish in 2009. To date there are 5 anthologies in the series, with a 6th in the works (“SHA’DAA: TOYS”) and even a Sha’Daa Novel in the planning. 30 authors have appeared in these shared-world volumes, and 4 new authors were recently recruited to begin work on TOYS. Sadly and tragically, 3 Sha’Daa authors, including the late C.J. Henderson, have passed away since their stories were published in this series, and they are sorely missed.